From the digital-wizardry action of I, Frankenstein to the alternate Igor-centered perspective of Victor Frankenstein, Hollywood has attempted to revive the mythology of Mary Shelley's eerie, cerebral tale in blockbuster form over the past few years, enjoying little success in these outside-the-box attempts. Instead working with a compact budget and a clear focus on updating the core concepts of Shelley's story for contemporary audiences, Candyman director Bernard Rose takes a stab at his own reinvention of the legend in Frankenstein, one that largely avoids gimmicks while focusing on the scientific boundaries being pushed by the creation of the fabled monster. While writer/director Rose has his head in the right place by concentrating on the evolving cognizance of Frankenstein's creation and the horrors that come about from his unawareness, there's too much overt gore and shock-value in the monster's interaction with the outside world without enough suspense or mental stimulation to balance it all out. Bits and pieces of Shelley's text have been kept relatively intact while telling the story from the point-of-view of "the monster" (Xavier Samuel), immediately dropping the point-of-view into an underground, nondescript medical practice where an experimental doctor, Victor Frankenstein (Danny Huston), and his staff -- including his wife, Marie (Carrie-Anne Moss) -- attend to a recently-awoken human specimen. He's a youthful male who looks to be somewhere in his twenties, yet his mental state is roughly that of a newborn infant, with the demands of a newborn infant in terms of nurturing and development. The complication with that comes in his physical strength, which makes the logistics of working with this lower-functioning creation, named Adam, incredibly difficult. This comes to a head when Adam escapes from the clutches of Frankenstein's staff, where he leaves the facility to wander the wide-open world without the mental capacity to grasp his surroundings, sending him to the city's outskirts and streets with little but his deformed appearance and absurd strength. Frankenstein aims to unhinge those watching with jarring aesthetics built around Adam's development and responses to the world around him, amplified by harsh lighting, persistent heartbeats, and ferocious editing built around what you'd expect if a newborn baby came out in a twenty-something-sized body. The Loved Ones' Xavier Samuel tackles the exhaustive physical demands of the role and shapes them into an unsettling childlike performance, expressing wonder and fright through his wide eyes and ungainly, turbulent body language. When combined with the unique maternal bond that's built with Carrie-Anne Moss' sturdy portrayal of Marie, an intriguingly raw experience forms in the bowels of the medical research facility, though the vagueness of the process that brought Adam to life can be a source of annoyance. Surgical scars are replaced with other nasty deformations -- by way of some impressive makeup work -- that both invite curiosity and leave one in the dark about what Adam really is, an intentionally-concealed secret that detracts from the story's limited science-fiction appeal. That's because this Frankenstein concerns itself more with getting to the brutality of the creature's rampage instead of the macabre nature of stitched-together limbs and electrical currents, sending him out into a fragile and unsuspecting world that cannot withstand his strength. Suspense should emit from Adam's unpredictable presence as he interacts with people both old and young, but early displays of gore have the opposite effect, where splintered skulls and bludgeoned bodies over-stimulate the thrilling aspects of the film. Despite coherent and poetic narration from Adam's point of view about the experiences, substance gets pushed into the background at every stop on his journey into the wild, emphasizing death and destruction above the more pensive tension of his interactions with a defenseless young girl and a sympathetic blind hobo (Tony Todd). Underneath the blotchy exterior and incoherent mumbling, there isn't much point to the creature's volatile and violent interactions with society. 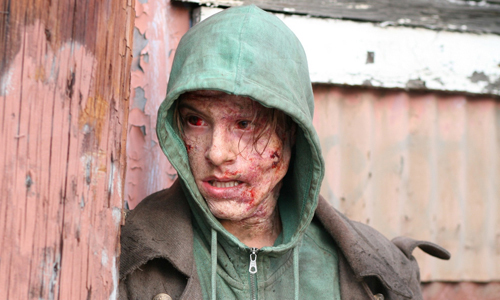 Even taking in account Xavier Samuel's capable responses in the skin of his monster, Frankenstein struggles with the erratic development of Adam's mental faculties, conveniently giving him just enough awareness -- or just enough lack of awareness -- to interact with the situations thrown at him. While this doesn't pose as much of an issue early on in his mental progression, since varying degrees of grunting, understanding, and single-word responses are easy to roll with for the sake of the concept, it grows more far-fetched when the story relies on a quick uptick in Adam's coherence for the sake of an expressive conclusion. Building to a messy last-ditch effort at formulating an existential point to Adam's creation at the hands of Dr. Frankenstein, writer/director Rose operates around revelations and twists that are again overshadowed by a desire to leave his gruesome mark with something overly startling. More blood should've flowed to Frankenstein's brain, sparking thoughts of Mary Shelley's themes about science and perception, instead of spilling outside its body.